Shortly after my roux-en-y gastric bypass surgery in December 2010, I developed lactose intolerance, which can be common for post-ops. After about a year was able to tolerate more and more dairy again, however I kept getting awful pains in my upper stomach and was experiencing other gastrointestinal problems as well. I went to see my bariatric surgeon, who originally thought I had an ulcer. He ran thorough blood tests, performed a CT scan, and did a scope down my throat. Much to our surprise, everything was perfect. He had never seen more perfect labs and said my pouch was the ideal pouch after bypass surgery. But he also said that I was the first patient that had ever stumped him. So, we agreed to start taking note of when these symptoms occurred. After a few weeks, I found the pain came whenever I ate gluten, a form of protein found in wheat. Most people think gluten can only be found in bread and pasta, but it can also be found in most cereals, granola, some protein bars, soy sauce and even barbecue sauce! I decided to try avoiding gluten to see if my symptoms got any better. After the first week, my symptoms disappeared. Not only that but I also lost 5 lbs. I felt so much better, so alive and energized. More recently, my lactose intolerance reared its ugly head again. I started to get chest tightness, congestion and pain, as well as nausea and bowel issues every time I ate cheese or yogurt, so I knew it had to go as well. Since then, my kitchen and cupboards are completely free of products containing gluten and dairy. My fiancé, who eats what I eat, has joined me in living gluten and dairy-free. I love my new lifestyle. It has kicked my fitness and health into high gear. I eat only fresh produce, certain grains, organic meats and eggs, and the occasional gluten-free snack. Some days it’s difficult some days getting my protein without consuming any dairy products but I’m committed to making this work. For me that means every meal has to be all lean protein of at least 20g, and I usually eat a protein bar every day as a snack. I wanted to share my experience because I know there are people who have Celiac’s disease and other special dietary needs and want to know if the post-op lifestyle will work for them. Hopefully my message will encourage them that you can do it! are so many lactose-free and gluten-free products nowadays! There is soy/almond/coconut milks, creamers and yogurts, there is also soy/rice cheese. The Silk brand is my favorite and I use it for all protein shakes. There are many gluten-free sauces out there for marinating and making stir-fry by the brand San-J. Most stores have gluten-free sections where you can do your shopping without the tedious task of checking every single label. (Whole Foods and Trader Joes are especially good with this.) However, if your store does not have a gluten-free section, READ YOUR LABELS. Anything that says wheat, barley, or rye = gluten. As for dairy, anything that has whey, casienate, or milk = dairy. “crust” for pizza with really fresh marinara, lean meat and veggies. Shop the perimeter of the grocery store. Being gluten-free and dairy-free also means shopping on the outskirts of major grocery stores. This also promotes clean eating. Grab your produce, your nuts and grains, meats, fish, dairy substitutes, and eggs all without heading down any isles. Not to say there aren’t some great quick canned options for some things. It can be difficult at first to give up something you think you “love”, but if you focus on how much better you’ll feel, it won’t seem like such a sacrifice. 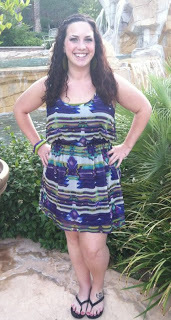 Stephanie is a Bariatric Foodie living in Henderson, NV. Are you a “Bariatric Foodie and…”? If you’ve got a unique angle to your post-op life, share it with your fellow Foodies! Email [email protected] to share your story.